Taking risks with a bit of faith is what financial investing is all about. One of Dr. King’s memorable quotes was when he said “Faith is taking the first step even when you can’t see the whole staircase.” When on the road to financial freedom, taking risks is a an essential part of investing. Some investors are highly conservative and often avoid risk. However, this leaves all types of investors even more vulnerable to the risk of missed opportunities, which never helps them reach their financial goals. 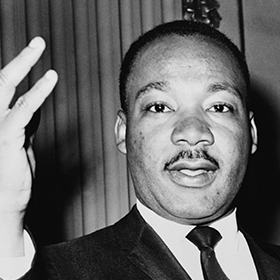 In Dr. King’s well-known “I Have a Dream” speech, he said, “We refuse to believe there are insufficient funds in the great vaults of opportunity of this nation.” Some industry experts explain that investing in things like a retirement plan or higher education is a better move than investing in a basic, stored-away savings account. Particularly because the investor can make better career moves and achieve a higher income levels in the future to put away more funds. Technically, it may be a smarter move to invest in your future. In 1963, Dr. King wrote his “Letter from a Birmingham Jail” and said, “Freedom is never voluntarily given by the oppressor; it must be demanded by the oppressed.” For example, everyone is always looking for better pay and more success in their career. The lesson Dr. King talks about is that we should not just hope, wish, and groan about our economic injustice, we should be at the front lines working for those things. Work hard, stand up for what your deserve, march, protest, ask and sacrifice what you live by to be the change you wish to be. Entrust offices will be closing at 3pm on Friday, Jan 13, and will be closed all day Monday, Jan 16 in observance of Martin Luther King Jr. Day. We will resume normal business hours on Tuesday, Jan 17.